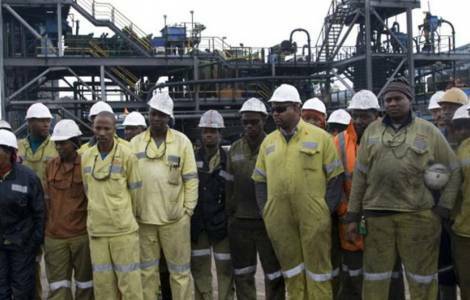 AFRICA/SOUTH AFRICA - "The hundreds of miners affected by pneumoconiosis are an indictment of human greed"
Johannesburg (Agenzia Fides) - "For decades, coal mining companies allowed their workers to be exposed to unsafe levels of coal dust. The mines need to take both ethical and legal responsibility for the sick miners", said His Exc. Mgr. Abel Gabuza, Bishop of Kimberly and President of the "Justice and Peace" Episcopal Commission of the Southern African Catholic Bishops' Conference in a statement sent to Agenzia Fides on the initiatives taken by the Church in South Africa to help the workers affected by pneumoconiosis, also called black lung disease, that is contracted in coal mines through inadequate protection from coal dust. South Africa is one of the countries with highest prevalence rate on black lung disease. "The fact that South Africa has hundreds of sick miners from coal industry is an indictment on corporate greed in the mining sector and its insistence on profit over the dignity of mine workers", said Mgr. Gabuza. He added that this situation is also "an indictment on the coal-based economy in South Africa. The human cost of coal-based economy should remind our country of the urgent need to transition to clean energy". "Most of the miners who become sick were sent home with little or no compensation after working in mines that have generated millions of Rands for their shareholders", emphasizes Mgr. Gabuza who supports the class action launched by hundreds of miners who have contracted the disease and by family members of the workers who in the meantime have died due to pneumoconiosis.